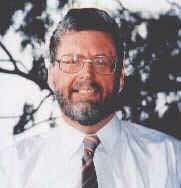 Dr. Glenn Russell is a lecturer in the Faculty of Education at Monash University, Victoria, Australia. His thirty years of experience in education have included twenty years as a school teacher, and ten years lecturing to undergraduate and graduate students at Australian Universities. His work in information and communications technology has been published in an extensive range of journals and magazines throughout the world. Glenn is a graduate of Monash University and has a Ph.d from Griffith University (Qld). His current research interests include virtual schools, educational futures and ICT, hypertext and challenges to school teaching practice, and pre-service teachers' perceptions of teacher training in ICT. Russell, G. and Holkner, B. (2000). Virtual Schools. Futures, 32, 887-897. Russell, G (2000). School education in the age of the ubiquitous networked computer. Russell, G., and Russell, N. (1999). Cyberspace and School Education. Russell, G. (1998). Hypertext stories: A radical transformation in English pedagogy? English in Australia, 121, 76-87. Russell, G. (1998). Elements and implications of a hypertext pedagogy. Computers and Education, 31(2), 185-193.
curriculum: An Australian perspective. Education, 117(4), 584-591.
professional development. Education and Information Technologies, 2, 1-14.
computer use for a cyberspace curriculum. Unicorn, 23(3), 2-10.
computer anxieties. Educational Psychology, 17(3), 267-284.
and intervention. Asia Pacific Journal of Teacher Education, 24(3), 245-257.